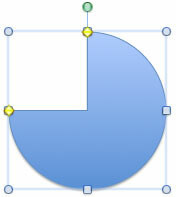 Learn how to flip shapes in PowerPoint 2011 for Mac. Select the shape. You know your shape is selected when blueish white handles, and a green rotation handle appear on the shape (see Figure 1). In some shapes, you may see one or more yellow diamond handles too -- but if your shape shows no such yellow handles do not worry. Now select any of the blueish white side handles (side handles are square, unlike the corner handles which are round), and drag towards the other end of the shape (see Figures 2 and 3). Hold the Alt (Option) key and drag any of the side handles towards the other end of the shape (see Figure 4). This will flip the shape from the center (but not proportionately) as shown in Figure 4 on the right side. 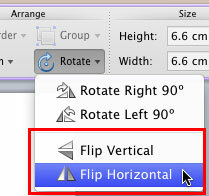 To get more exact control over the flip, select the shape and double click it to activate the Format tab on the Ribbon. 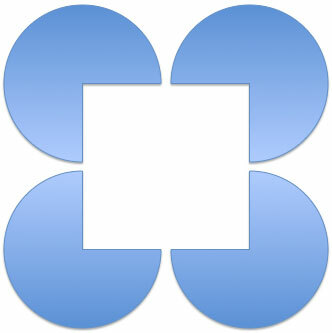 In this tab, locate the Arrange group and within this group, click the Rotate button to access the Rotate gallery (see Figure 5). Choose either Flip Vertical or Flip Horizontal (highlighted in red, refer to Figure 5). Figure 6 displays the selected shape (refer to Figure 1) flipped horizontally. You can make the copies of your selected shape, and then flip them differently to create some pattern as shown in Figure 7.